Not many fathers refer to their children as free-range chickens, but for Renato Stanford of Southold, the description is apt. That’s because his yard is where the bulk of his family’s food comes from. This former efficiency expert with a career at Dupont behind him experienced a life-changing event 10 years ago when he was in a car accident that took his wife’s life. Since then he has been dedicated to growing his own food, going to the supermarket as little as possible and taking advantage of what he says comes naturally to him: making things grow. 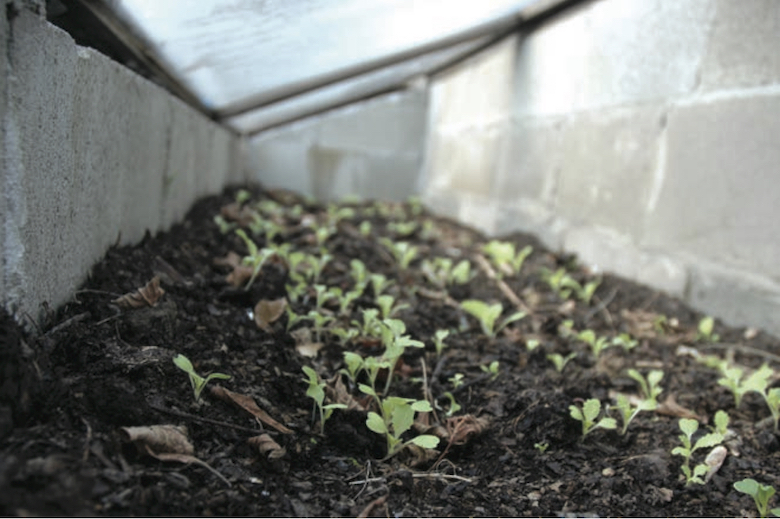 His hoop house is essentially a dugout; one enters by going three steps down so the beds are waist high. This helps to preserve the heat, which is all captured solar energy. He uses no chemical fertilizer and no pesticides. He’s thinking about adding chickens and he says his son’s favorite food is arugula. When this kind of thing works out for someone, it’s hard not to be an evangelist. This summer Stanford set up a booth at the Westhampton Beach Farmers Market offering to build personalized hoop houses, so everyone could have fresh greens year round. Stanford credits his Italian upbringing with instilling in him the desire to grow, to grow anything, anywhere. He remembers his Great Uncle Sebastian putting him in his garden as a child and letting him dig and plant. This led to finding a space, any space, to plant tomatoes. The hunt for space continues. So far, Stanford had helped Southold Schools plant their community garden and is working on a project with the Concourse House in the Bronx, a shelter for homeless families.